Gabriel Voisin (February 5, 1880 - December 25, 1973) was among aviation's earliest pioneers (1903) and the creator of Europe's first engine powered, heavier-than-air flying machine capable of a sustained circular ( 1 km) controlled flight, including take-off and landing. It was flown by Henry Farman on January 13, 1908 near Paris, France. Later on, Gabriel Voisin became a major producer of military aircraft, notably the Voisin III, during World War I. Finally, he designed and built exceptional automobiles bearing the name Avions Voisin, during the 1920s and 1930s. He was born at Belleville-sur-Sax�ne, France, and his brother Charles, two years younger than he, was his best friend. When his father abandoned the family, his mother, Am�lie, took her sons home to Neuville-sur-Sax�ne, where they settled near her father's factory. Their grandfather, Charles Forestier, took charge of the boys' education with military rigor. The boys also went for expeditions along the river, went fishing, and built numerous contraptions. When his grandfather died, Gabriel was sent to school in Lyon and Paris where he learned industrial design, a field in which he was exceptionally gifted. However, he often returned home, and by the end of the century, the brothers had built, among other things, a rifle, a steam boat, a glider, and an automobile. In 1900, Gabriel was hired as a designer for the Universal Exposition in Paris. There, he met Cl�ment Ader, who fueled his interest in aeronautics. In June 1905, Gabriel Voisin tested a glider he had designed and equipped with floats by having it towed on the Seine river by a fast boat . Motion picture footage of this experiment survives in the Smithsonian's National Air & Space Museum. The glider's wing configuration was made up of Hargrave cells, a box-kite-like structure that allowed for great lift and structural strength with minimal weight. Financing of this early Voisin glider had been provided by a wealthy Parisian enthusiast: Ernest Archdeacon. The latter had been prompted by Octave Chanute, a noted French-born railroad engineer from Chicago who had designed several biplane gliders during the 1890s . When the day came for the flying test, Gabriel Voisin was towed into the air by the motor boat "La Rapiere" and flew for a distance of 600 metres (1800 ft) and at a height of about 20 metres (60 ft) above the river. When the glider came down on the river, Voisin became entangled in its wiring and nearly drowned. 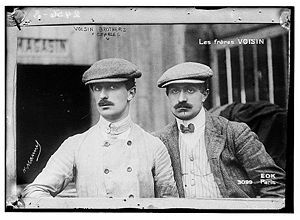 Gabriel Voisin and his brother Charles Voisin created Europe's first successful heavier-than-air flying machines. Before the Voisin brothers, Alberto Santos-Dumont made Europe's first widely hailed airplane flight ( 700 feet ) on November 12, 1906 at Neuilly-Bagatelle ( a western suburb of Paris). Detractors of the Voisins argue that the Santos-Dumont 14-bis was only marginally controllable and could not fly out of ground effect, thus disqualifying it as an airplane. If the same argument was applied to the first Wright Flyer of December 17, 1903 it would also disqualify it since its flight was short, within ground effect and in a straight line. Less than a year after the Santos-Dumont flight, the Voisin brothers had designed and built a pusher biplane, powered by a direct injection "Antoinette" V-8 engine, that took off on wheels and could fly reasonably well. Purchased and modified by Anglo-French aviation pioneer Henry Farman, a Voisin biplane on January 13, 1908 at Issy-les-Moulineaux became the first airplane in Europe to succeed in landing back where it had taken off after flying a pre-assigned 1 kilometre long closed circuit. Farman, a fine pilot, accomplished this by skidding around while banking the machine by rudder control. Farman's competing with bicycles on steeply inclined race tracks had taught him not to fear the experience. He had to turn that way because no airplane in Europe yet had ailerons or wing warping providing much easier and gentler three-axis control. In August 1908, Wilbur Wright demonstrated , during his first flights in France at Le Mans, the importance of lateral control (missing so far in European designs) and the coordinated use of elevator, rudder and wing warping for making turns. By October 1908, Farman had followed their example and improved his Voisin airplane by installing controllable wing ailerons. Unlike the Wright brothers' early airplanes, the Voisin biplane flown by Farman on January 1908 took off and landed on its own wheels rather than on skids. With a more powerful Antoinette V-8 engine than the 4 cylinder engine in the early Wright Flyers, the 1908 Farman-Voisin did not need a catapult for take-offs. History's first manned airplane flight ( 120 feet in a straight line ) , as performed by Orville Wright on December 17, 1903, began with a controlled take off flown against a 25 MPH sea breeze and entirely under the Wright Flyer's own engine power. It is highly significant that full control by the pilot around all three axes (pitch, yaw, and roll) already existed on the 1903 Wright Flyer . It was first to incorporate all the controls that are necessary to an airplane. Prior to Wilbur Wright's August 1908 flying demonstrations in France, the Voisins and other European experimenters had produced less maneuverable airplanes with only two-axis control (elevator and rudder only) . If the Wrights lagged by not moving sooner from skids to wheels, Voisin lagged by resisting change. 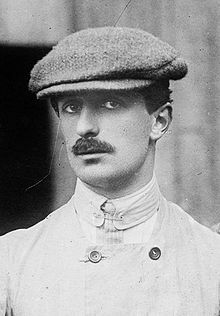 Whereas Levavasseur of "Antoinette" fame, Louis Bl�riot, Henry Farman (who with his brother Maurice went on to manufacture airplanes of their own) and other European airplane manufacturers quickly emulated the Wrights, Gabriel Voisin refused to add roll control onto his 1908 flyer. Instead he progressed to more advanced biplanes, now with roll control, which he supplied in large numbers to French military aviation during WW-1. In the United States, Glenn Curtiss also availed himself of the Wrights' invention of three-axis control. Consequently, when the world's first air meeting was held at Reims, France, in August 1909, Voisin biplanes were the only participating aircraft that lacked any provision for roll control. Henri Farman did much to popularize the Voisin biplane, which was a sturdy and dependable machine despite its limited and generally difficult controlability. Farman made many improvements to Voisin's basic design, and much of this early pusher biplane's success and acclaim can be credited to Henri Farman and another Voisin pilot Leon Delagrange. Flying in the same Voisin biplane in which he had performed Europe's first 1 kilometre circle in January 1908, Farman expanded his records with much longer cross-country flights outside of Paris. An important factor in these feats was that Farman had improved his Voisin biplane with a set of movable wing ailerons that he could control from the pilot's position. For instance, on October 30, 1908, Henri Farman flew non stop his modified Voisin-Farman biplane over 27 kilometres (16 miles) in 20 minutes, between the towns of Bouy and Reims in eastern France. For the record, the locations associated with earlier and much shorter flights, Neuilly-Bagatelle, Issy-les-Moulineaux and Billancourt (where the Voisin brothers had their first factory), are all suburbs on the west side of Paris. Gabriel and Charles Voisin created in 1905, and then operated for many years, the world's first commercial airplane factory, Appareils d'Aviation. Les Freres Voisin. Later, after its major expansion into military airplanes, notably the Voisin III, which was widely used for spotting and bombing during World War I, the firm's name was changed to Avions Voisin. Gabriel Voisin turned to luxury automobile manufacturing after World War I and continued in that endeavour until 1938. Whereas historians universally credit the Wright brothers with inventing the airplane, Voisin-who outlived most other "early birds" -- remained their detractor. That personal bias unfortunately clouds due recognition of this pioneer's very real accomplishments. In 1909, Gabriel became the youngest Knight of the French Legion of Honor at 29. By that time, he was considered a true industrialist. Picture - The first seaplane carrier, the French La Foudre (right, with hangar and cr ane), with one of her Canard Voisin seaplanes, the first operational seaplanes, during tactical exercises in June 1912. In 1910, Gabriel and Charles Voisin developed the Canard Voisin - original in design, with its main wings positioned at the back. With the addition of floats, it also became the first seaplane of the French Navy. The Canard Voisin was broadly similar in conception to Alberto Santos-Dumont's 14-bis airplane, in which the main wings were placed at the aft of the aircraft in order to facilitate horizontal control and stability at landing. At the front, a small horizontal stabilizer was installed. The plane, named "Canard" because of its aft-heavy shape, was successfully tested by Maurice Colliex at Issy-les-Moulineaux between March and May 1910. The Canard was equipped with a 60HP Anzani radial engine (among others). The first military seaplanes were developed by Voisin in 1910, by attaching floats to the wheels of their Canard Voisin. He married Adrienne Lola Bernet in 1909, and they had one daughter, Janine. He was greatly affected by the death of his brother Charles in 1912 in an automobile accident. Gabriel Voisin abandoned aviation, citing the trauma of the military use of his more advanced airplanes (the Voisin III) during the war in addition to the then embryonic demand for civilian aircraft. From then until 1958, he concentrated his efforts on making automobiles under the marque of "Avions Voisin". His early cars were some of the finest luxury vehicles in the world, with unique technical details. Many of them won in competition. However, the luxury car market shrank in the late 1930s because of depressed economic conditions and he closed down his factory. After 1945, he turned his attention to designing a minimalist car for the masses, the Biscooter, thousands of which were produced under licence in Spain during the 1950s as the Biscx�ter. Today, his pre-war luxury automobiles have become highly prized by collectors, both in Europe and in the USA. In 1960, he retired in his country house near Tournus on the banks of the Sax�ne river, where he wrote his memoirs. In 1965, he was made a Commander of the Legion d'Honneur. He died in 1973 in Ozenay, Sax�ne-et-Loire at the age of 93. L�on Lemartin - Engineer on the Seine glider and the Gnome Omega rotary engine. Gabriel Voisin,1960, "Mes 10.000 cerfs-volants" ( My 10,000 airplanes) and Gabriel Voisin,1962, "Mes milles et une Voitures" ( My 1001 automobiles ) . Both volumes of memoirs(in French) are authored by Gabriel Voisin himself. Editor: "Editions de la Table Ronde", Paris, France . Gabriel Voisin , 1966, "Henry Farman", in :"Pionniers. Revue Aeronautique Trimestrielle des Vieilles Tiges " No7. January 1966. Special issue dedicated to Henry Farman (1874-1960) .